Photograph taken prior to the 1928 enclosure of the cabin. Courtesy of the Kansas Historical Society. John Brown (1800--1859) came to Osawatomie from his farm in upstate New York in October 1855 after three of his sons, who had arrived earlier in the year, appealed to him for help against proslavery forces in the area. While in Kansas, Brown was involved in a number of skirmishes in the so-called Bleeding Kansas" era, including the "battle" of Osawatomie on August 30, 1856. The John Brown Cabin was built in 1855 by Samuel Glenn, who sold it to Samuel Adair, Brown's brother-in-law. 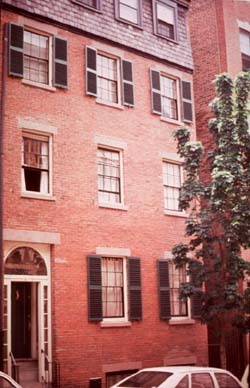 Brown frequented the cabin and occasionally used it as a headquarters for his abolitionist activities. 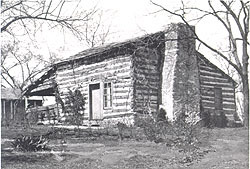 Built about a mile west of Osawatomie, the log cabin was dismantled and reassembled in its present location, John Brown Park, in 1912. A stone pavilion was constructed around the cabin in 1928, however the interior of the cabin remains much as it was when Brown was a frequent visitor and contains much of the original furniture. John Brown only lived in Kansas for about 20 months, but his abolitionist activities leading up to his infamous raid on Harper's Ferry have been closely associated with the state. The Adair-John Brown Cabin is located at the Adair Cabin State Historic Site in Osawatomie, Kansas. It is open to the public Wednesday through Saturday, 10 am to 5:00 pm and Sunday, 1:00 pm to 5:00 pm.